A few weeks ago I had the pleasure of meeting the lovely Minling Pan of MIN Design. She is a Toronto designer who has won many fashion awards for her collection of beautifully crafted accessories that emphasize minimalism, independence and novelty (also an acronym for her name). 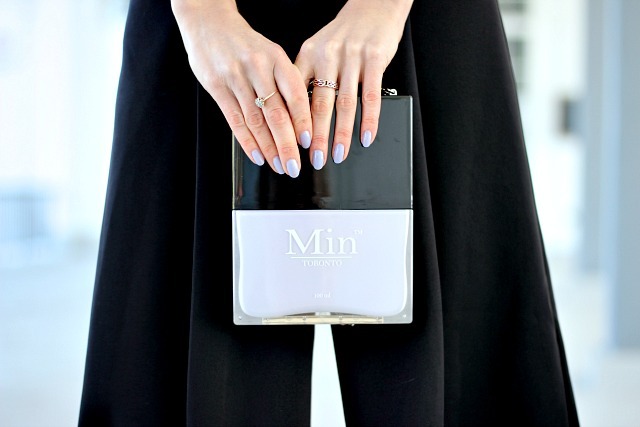 MIN Design has just launched their collection of Nail Polish Clutches, and with just one look at the bag it's easy to see where Minling's inspiration came from…. a great mani of course! The bags are beautifully built, and surpasses the norm in both sophistication and playfulness. This past weekend I brought the bag out for a night on the town and really felt the slogan come alive! The slogan is "Your head-turning moment", and that's exactly what happened to me, head's were a turnin'! I mean how it could not when your sporting such a fun statement piece. The collection boosts bright colours like true red, sky blue, lucite green and even gold, but I was drawn to the pastel perfect lilac shade. Minling definitely knows her shades, and not to mention loves a good mani! She manually matched the shades to the nail polish tones she wanted to achieve, and then painted from the inside to get that nail polish bottle feel. How cool is that?! The bag is a standout piece and since I wanted to let it shine I paired it with black and white; black culottes and a black and white vertical stripe romper. Yes, you read that correctly. This "top" is actually a romper worn underneath! Gotta make best use of your closet, right? However-- it did make for unfortunate washroom situations. Since the name of the game was fun I elevated the look with my accessories. Black lace up heels, and a neck scarf. This was my first time testing out the neck scarf situation and I kinda get the craze now! This scarf, which I usually tie around a bag handle, is by Dayna Lee Collection and it's lists off a girl's favourite things in the most adorable print. Think coffee, Paris, wine, books, macarons, etc. So fun! What do you think of my playful accessorizing? Be sure to have your own head turning moment and check out MIN Design's collection of head turning accessories! This post was sponsored by MIN Design, however all thoughts and opinions shared are my own, through and through! Thanks to La Petite Noob for capturing these shots! I can totally see why heads were turning, you look STUNNING! Love how you styled this outfit, and cannot believe your top is a romper! Dying over this look! Thank you Siffat! I know-- I was totally skeptical at first but the romper totally worked underneath! This is one of my fave looks you've posted! Love the black and white against the fun, lilac clutch! So cute girl! 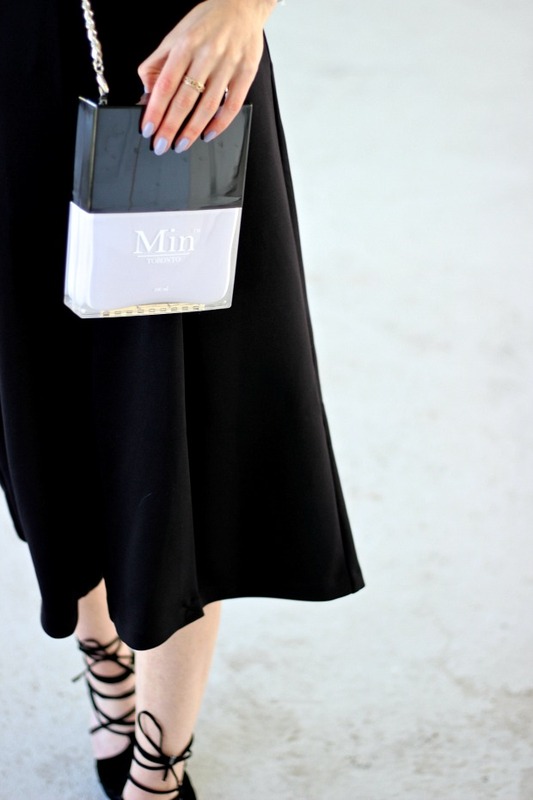 The clutch is so perfect for girls nights out! SUPER gorgeous look! Love this babe! AMAZING style! Happy Monday darling! Thanks so much darling! Loving your spring style, too! Such a cute clutch!! And I am in LOVE with this outfit. It suits you so well! Thank you, Kris! Loving playing with different styles to really switch it up! Wow, your whole outfit is so glamorous! That bag is such a fun accessory and a total showstopper! I want that bag in every colour! I just love your blog! I am always pinning things from you which is proof. Just scheduled this look to pin too. Amy Ann! That is so sweet of you to say! Can't thank you enough! Your spring style has been killing it lately; I'm always pinning your looks too! Aww thank you Glenda! So nice of you to comment!